ORANGE COUNTY'S FINEST PHOTO RETOUCHING & IMAGE DESIGN EXPERTISE. There's nothing quite as thrilling as taking an old or battered family photograph and - using the modern tools like Photoshop CC - enhancing and restoring the image so that it comes to life all over again. 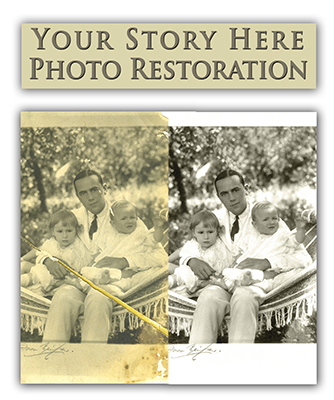 If you have a cherished photograph that needs restoration or repair, chances are it can be restored to its former glory. In some cases, we can even do better. Really. Normally we start with a good quality, high resolution scan (around 600 dpi) of the photo. This is something you may be able to do yourself - or you can leave it with us. Then we assess the image for color balance, contrast, density, composition, orientation, damage and tears, dust, and digital noise (often an artifact of poor scanning). Then we set to work! Most images can be restored in just an hour or so. We always email you a "before and after" preview to ensure you are satisfied. Then we print on premium paper. Are some images beyond repair? Or, there may be pictorial information available in another image of the same person or the same subject matter of the treasured photograph that we can use to fill in what may be missing. We also restore images and create designs for web use, books, DVDs, posters and public events such as presentations and memorial services. It is especially important that we ensure that your image is right-sized, to avoid that ghastly pixilated, stair-stepping effect of poorly prepared images! Photo restoration and photo repair is as much about art and sensibility as it is about the technical expertise of manipulating the digital software. Out of focus: Very little can be done for a photo which is badly out of focus. Other aspects of the image can be enhanced, and "sharpening" can improve things marginally - but not much. Matt or patterned paper: Another photo restoration nightmare is heavily patterned paper. This challenge is less severe for photo repair than poor focus, and mercifully there are a few trade secrets for getting the best outcome. Staining: Strong color staining (e.g. from a liquid spill) is the third biggest challenge for photo restoration. In many cases, it will not be worth the time and expense of repair and the image is simply converted to black and white, or sepia to produce an improved image. Did you know that you can email us images for us to restore and repair? It helps to have a nice, high resolution scan to work from (say, around 600dpi or so). It also helps to make sure that your scanner glass is gleaming - and that you have blown all the dust off. If you are not sure if it's worth going to the trouble of one of our careful, professional restorations then why not send us a scan of the image and allow us to give you a free, no obligation estimate. In most cases, we will get back to you the same day! Everything is still current right here on this page - but even more information about our photo restorations and photo repairs is now available on our exciting shiny, new and expanded, mobile-friendly website! 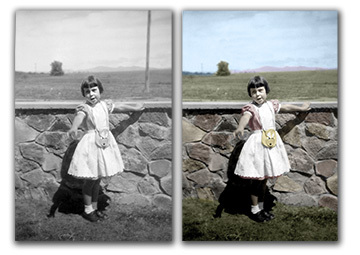 We specialize in photo restoration and repair,as well as graphic design for video and DVD projects. Maybe you just need a person removed from a group shot. Maybe the image is discolored and stuck to the glass. Or torn or stained or faded or discolored. We can help with that and we also handle poster projects, from image enhancement - to design and the addition of text and graphic elements - to photo enlargement suitable for large scale reproduction. All work is done using scanned digital copies of original photographs - no change is made to the native image. Check out the photo repair and image design projects on this page (including the various page banners) - and look around the rest of our website! All image designs by Your Story Here LLC. Photo restoration and photo repair service, and digital image graphic design now available in Orange County, California and more widely through digital drop-off and delivery. La Habra 90632, La Habra 90633, Stanton 90680, Los Alamitos 90720, Los Alamitos 90721, Seal Beach 90740, Sunset Beach 90742, Irvine 92602-4, Huntington Beach 92605, Irvine 92606, Laguna Niguel 92607, Lake Forest 92609, Foothill Ranch 92610, Irvine 92612, Irvine 92614, Huntington Beach 92615, Irvine 92616, Irvine 92618-23, Capistrano Beach 92624, Corona Del Mar 92625, Costa Mesa 92626, Costa Mesa 92627, Costa Mesa 92628, Dana Point 92629, Lake Forest 92630, Huntington Beach 92646-8, Huntington Beach 92649, East Irvine 92650, Laguna Beach 92651, Laguna Beach 92652, Laguna Woods 92653, Laguna Hills 92654, Midway City 92655, Aliso Viejo 92656, Newport Beach 92657-9, Newport Beach 92660, Newport Beach 92661-3, San Clemente 92672, San Clemente 92673, San Clemente 92674, San Juan Capistrano 92675, Silverado 92676, Laguna Niguel 92677, Trabuco Canyon 92678, Trabuco Canyon 92679, Westminster 92683, Westminster 92684, Westminster 92685, Rancho Santa Margarita 92688, Mission Viejo 92690, Mission Viejo 92691, Mission Viejo 92692, San Juan Capistrano 92693, Ladera Ranch 92694, Irvine 92697, Aliso Viejo 92698, Santa Ana 92701-3, Santa Ana 92704, Santa Ana 92705-7, Fountain Valley 92708, Irvine 92709-10, Santa Ana 92711-2, Fountain Valley 92728, Santa Ana 92735, Tustin 92780, Tustin 92781, Tustin 92782, Santa Ana 92799, Anaheim 92801-8, Atwood 92811, Anaheim 92812, Anaheim 92814-17, Brea 92821, Brea 92822, Brea 92823, Anaheim 92825, Fullerton 92831-4, Fullerton 92835, Fullerton 92836-8, Garden Grove 92840-4, Garden Grove 92845, Garden Grove 92846, Anaheim 92850, Orange 92856-7, Orange 92859, Villa Park 92861-9, Placentia 92870, Placentia 92871, Yorba Linda 92885, Yorba Linda 92886, Yorba Linda 92887, Anaheim 92899 . We also offer photo restoration, photo repair and enhancement, and image and poster design in Los Angeles County and beyond - by arrangement. If it's just a question of giving the image an overall boost (whether you snapped the pics yourself, or scanned them) there are 5 main adjustments you need to make to get them looking like the cat's meow. And you don't need specialist tools like Photoshop CS5 - these simple tips should work with most free or cheap digital image editing programs. Digital images tend to suffer from the same problems time and time again. And most of those problems have been with us from the days of film. The difference now is that with digital photography, and all the free or cheap digital imaging software, you can achieve a basic level of photo retouching and restoration. So here are five tips for tip-top shots. It is best to do them, or at least consider them, in the order presented here. A shot that just looks wrong is often just crooked. You shot in a hurry, or you were on a boat - whatever - it can easily happen that the people look like they are going to slide out of the picture altogether. The tip here is to rotate your photograph so that the horizon is aligned with the horizontal top or bottom edge of the image. Most programs will allow you to rotate (or "straighten") just a couple of degrees - which is often all that is needed. 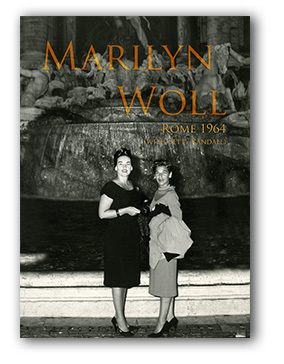 It may be that the central interest in the photograph is too far away or two small. (In addition, having aligned and rotated your image, you may find that you have some triangular shaped white spaces around the edges.) This is where you will "crop". Cropping will drag in the edges of the image bringing your subject closer. Avoid putting your subject right in the middle of the photo - best to place them in the imaginary line defined by one of the vertical thirds (this is called the "rule of thirds"). Looks more natural that way. Color saturation is the amount of color intensity in an image. Too much and it looks garish and cheap, not enough and the thing looks anemic. 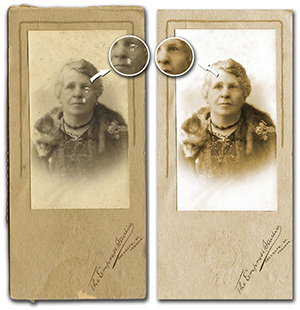 (If you are restoring or retouching old photos which you have scanned, fading is a very common problem.) Adjusting your color saturation will bring things back into the realm of nature. Keep in mind that the way your computer renders the digital image color information is different to the way your printer renders it. Keep in mind also that your photograph will look different depending on what brand and what type of paper you are using. The other adjustment that a lot of image software provides is "color temperature" or color tint. Sometimes photographs require retouching or restoration because they have a distinct blue or yellow cast and this slider can bring the image back where it should be. The tip with color adjustments is to adjust the color on screen to your liking, print the image, then if any changes are need (e.g. the photo looks washed out) you can over-adjust in the program. There is an indefinable quality to a great photograph. It just seems to "pop" - it has real eyeball grabbing impact. In many cases, the reason is that the image has a full tonal range. In other words, it has true whites and true blacks and the normal range of tones in between. 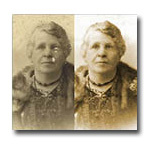 The most common reason for a washed out photograph requiring retouching or restoration is that the blacks are dark gray and the whites are muddy. So, you must adjust the contrast. Don't be scared to "go long" with this one - really boost the contrast and see how it prints. Adjust down if necessary. Digital photographs sometimes look a little soft or blurry. You may not see it on your computer monitor, but it is often noticeable in the print. Now there is a little understood and seldom used effect or adjustment called "sharpening". What this does is increase the contrast between light and dark pixels in your image. The result is that the photo looks like it is more in focus. Hard to believe? Try for yourself! There really is no limit to what you can do with digital editing and photo retouching and restoration. And once you have mastered these 5 steps, you will be ready to think about more advanced digital manipulation and the production of complex images that combine layers and text.